The Dana 20 is found in 1962-1979 Jeep vehicles. It is also found in IH and Ford vehicles as well as a limited run of GM trucks in the early-mid 1970's. The Dana 20's design was outstanding and remains one of the strongest and most refined of all the popular transfer cases. You can't fully know the Dana 20 without knowing its great predecessor, the Dana 18. The 20 was evidence of genius at Dana Spicer. It was an important redesign of the Dana 18, yet used many parts that interchanged with the 18. This transfer case was released in 1962. It was called the "silent-type" due to its centered rear output housing that allowed for its efficient direct drive in 2wd. Its output housing bolted into the same space provided by the earlier 18's PTO port. A sliding output gear acted also as the output shaft coupler to the input gear's clutch ("bull") teeth. 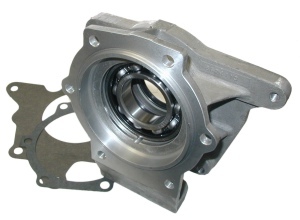 The Dana 20 is a cast iron transfer case, having a passenger-side front output and a centered rear output. It has the same "Texas" front mounting input flange as does the Dana 18. Markings on the Dana 20 can vary, but most start with a C18-15-24... Some confuse them for a large case Dana 18 because of this. It is of note that the 20 was based off of the design of the 18 and Spicer used this numbering scheme throughout the span of the production of the Models 18 and 20, which for a time were built concurrently. It should be mentioned that there was a variation of the Model 20 - the Model 21. This version, found only behind automatics, had a single speed only. The FSJ Wagoneer (year range not yet documented) and the J100 (1962-1965) Gladiator with the Borg-Warner automatic were the only Jeeps to feature this model. A version is found in Fords. This transfer case is compact, light, durable, simple to build and capable. It features dual modes (2wd + 4wd) and dual ranges (Hi + Lo). The high range is direct drive (1:1) and the low range is 2.0:1. This transfer case is among the most compact in the world. The Jeep version (others similar) is only ~10-1/2" long from the front input face to the rear yoke face. The front input flange is shaped like Texas, backwards and uses five 3/8" mounting bolts through to the transmission. 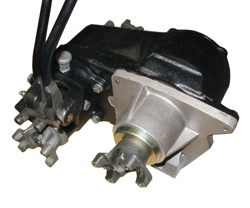 The front and rear output yoke is a 1310. The output shafts are 10 splines for earlier units and 26 splines for later units. The increased number of splines was done for speed of manufacturing - as the smaller splines could be roll-forged instead of machine cut like the coarser 10 splines. There is an interlock pin between the shifter rails. Removal of this interlock allows for the added function of 2wd/Low and front-wheel-drive High or Low to the 20 - if you have the "twin-stick" version (see below) of the 20. Dana 20's in the Commando Jeeps sometimes featured a smaller 1210 front output yoke and a two-piece driveshaft that was supported by a carrier bearing on the frame of the Jeep, for clearance from the crossmember and the factory exhaust Y-pipe. Largely the focus of our discussion, the Jeep Dana 20's differed very little mechanically, however, there were several different shifter versions depending on the years and applications. Remote style "J" shift versions are problematic. Some versions will offer challenges in conversions to other vehicles or transmissions. Upgrading to an aftermarket shift kit, like this twin-stick shifter kit, is a good idea for many situations. There are OEM (shown) and aftermarket versions of TH400 to Dana 20 adapters. 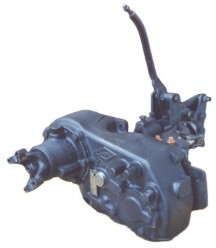 This is an enhanced version of Jeep's 8624113 assembly. The original was prone to breakage in the casting. It's single bearing design was not ideal in light of the side forces on the input gear, but workable. We make a stronger version of this, or the installer can further upgrade to Novak's #124 kit replacing these. It features a better twin bearing design. The International Harvester Dana 20 is very similar to the Jeep versions, sharing many of the same components. Input gear spline counts vary for automatic applications, but the remainder of them carry the familiar six-spline input that is the default for our adapter assemblies. Individuals wishing to adapt these transfer cases can refer to the Jeep Model 20 in their research. A version of the Dana 20, though rarer, found its way into 1969-1973 Chevrolet Blazers. They were much less common than the NP205 and NP203. We have seen one Dana 20 in a Chevrolet truck with the TH400, but there is no documentation to support this being a factory combination. A similar version of the Dana 20 was made for the Ford Bronco. It featured a 2.46:1 Low gear and a driver's side front output shaft. The internals are similar to the Jeep, IH and Chevy versions, but the front mounting pattern is quite different and not compatible with the other popular Dana 20 adapters and transmissions. Of note, it is possible to swap a Bronco sliding gear into the Jeep or IH Dana 20's - along with Model 18 gears - to acheive a 2.46:1 Low. A few Ford applications used a single speed variant of the Dana 20; the Dana 21. They are similar in construction to the Jeep Dana 21, but having a bolt pattern similar to the Bronco Model 20. We are often asked our opinions about the strength of the Dana 20. The reader should be aware that these were the transfer cases that were found in the Jeep J4000 one-ton truck, where they perform most admirably. A Model 20 that breaks is usually due to a worn intermediate shaft and bearings, other worn bearings, or from the shock force resulting from an unskilled driver panicking his way through a rock patch. We've yet to see a broken Dana 20 transfer case in our own service, and we find them to be a most outstanding gearbox. It is nearly remarkable how much power this compact transfer case can transmit and sustain. It is not so rare to see them handling Big Block grade power and deep, compound gearing. The 10 spline vs. 26 spline shafts show no greater nor less tendency towards breakage, as the shaft diameters (the real measure of strength, not spline count) are very similar. The gearset in the Dana 20 is strong, but unbalanced. The front seat is helical and the rear set is spur cut. When in low range and under extreme torque, the helical gears produce significant side loads against the case. Though breakage is not at all common due to this, it is possible. We've discussed the Dana 20 case casting with individuals and a couple have mentioned that Dana cast three or four different thicknesses depending on whether they were slated for an HD J Truck, other FSJ, Commando or CJ. We've not seen evidence of this, but will keep our eyes and ears open. A benchtop rebuild of a Dana 20 is doable and possibly even enjoyable by the shadetree mechanic or experienced technician. 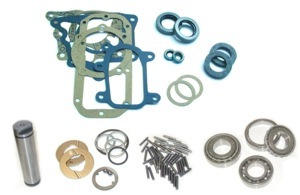 Parts are readily available both new and salvaged, along with standard rebuild kits that address the common wear points. Our classic rebuild guide is found here and offer indication as to the tools and techniques involved. Our parts, which include a specially hardened intermediate shaft, are always available and kits have been configured to address the wear points and upgrade where possible. Gears and other components remain largely available and in production. Ask us if you require something not seen in our catalog. Nearly all parts remain available for the Spicer 20. 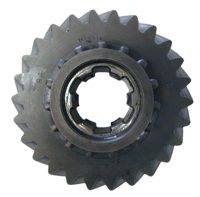 A variety of gear cuts, spline counts and tooth counts in the Dana 20 gears existed. Anyone wanting to check for gear replacement and interchange will benefit from this chart. Mixing the wrong parts will cause substantial mechanical grief. We've compiled a non-definitive list of some factory speedometer gear combinations we've found disassembling a great many Dana 20's over the years. If you have any contributions of knowledge to make to this list, please contact us and we'll make any additions or corrections. Unfortunately, Novak doesn't have new or used speedometer parts for sale. They have become rarer than we'd like. Perhaps at some future date, we or others in the market will manufacture them and make them available. Novak's Dana 20 divorced transfer case adapter assembly. The Dana 20 is among the best transfer cases ever built. Their strength, ease of service, compact design and excellent parts support make them a top choice in many Jeeps.